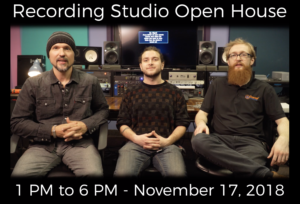 Come see performances from some of the Twin Cities best artists live in a recording studio setting. Also, tour through our studio and rehearsal complex as we unveil a new and improved set up. The event is open to the public and is aimed towards people involved in the music, audio, and video industries. We have been upgrading and reconfiguring the studio to make it as accessible as possible to artists, engineers and producers. There are also several “band shares” and rehearsal spaces for groups to rent out. Our intention is to open the space to creative individuals to use as a home base for their media projects. This event will be professionally livestreamed by RICCI Media Group and is supported in part through a partnership with Cloverleaf Audio-Visual.